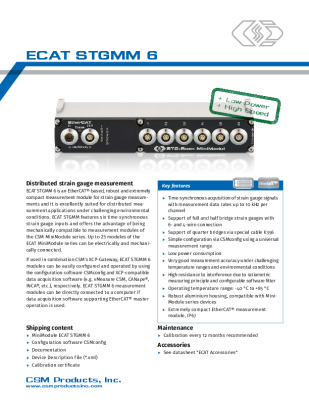 EtherCAT® STG MiniModules | CSM Products, Inc. This EtherCAT® measurement module from CSM allows e.g. fatigue analysis with more than 1,000 distributed points of measurement. The modules support data rates from 1 Hz up to 20 kHz per channel. The compact and robust MiniModule can thus be mounted close to the points of measurement, which in turn increases the quality of the measurement signals and decreases the cabling efforts considerably. As an Ethernet-based data bus, EtherCAT® also allows large measurement networks with distances of up to 100 m between the individual measurement modules. This provides options for the synchronous acquisition of strain from widely separated points of measurement, such as in the case of rotor blades of wind turbines as well as construction cranes. Measuring mechanical stress in assemblies and materials fast and reliably: Strain and compression measurements with strain gauges provide precise results regarding the forces that are applied to components for structure tests, durability measurements as well as product and material testing.